Nathan P. Gilmour , 6 March 2015. Without a doubt rules do something when we undertake disciplined thought. But when we try to articulate universal claims about rules, they fall flat. Wittgenstein asks us to remember the sight of railroad tracks stretching out to the horizon (easy enough for one who grew up in Indiana) and suggests that when we try to imagine the universal applicability of any mathematical or other rule, that thought is something like the thought that those train tracks, extended without stopping, would be infinite (218). Theoretically that might be true, but most of us are at a loss to say how that relates to actual railroad travel. For all that, rules aren’t unavailable to most of us the way, for example, inspiration is (232). Inspiration, the way we usually tell our stories of the Muses, comes unbidden and refuses to come when folks too readily rely on inspiration. A rule, at least in theory, is as good at one point in a series as it would be at any other point. Once again Wittgenstein’s work does not articulate its own rule so much as to encourage us, the readers, to examine closely what normally doesn’t seem worth a second thought. In this case, something as unremarkable as following a rule in mathematics becomes, upon examination, something that one can experience but falls apart when one tries to examine its “essence.” At one point, perhaps with tongue in cheek, Wittgenstein even remarks that “being guided by the rules” seems magical, beyond explanation, perhaps even reason for “giving thanks to the Deity” (234) as we perform it. In the next section he calls such processes (as a joke?) “the physiognomy of what we call ‘following a rule’ in everyday life” (235). The discipline here continues: the text invites us to formulate a universal rule, then leads us to despair that there are any rules, then demonstrates that our actual forms of life are unintelligible without the rules. As example after example roll by, if we attend to the thought-experiments without falling to our temptation to regard them as museum pieces for beholding rather than exercises for performing, we learn both to mistrust any given theoretical formulation and to continue examining, knowing that something (rather than nothing) must be happening. Such is not to say that everyone agrees on the content of such happenings, but without something like agreement on what linguistic forms constitute agreeing and disagreeing, there are no grounds to strive for truth in the first place (241). We can disagree about how accurately this or that researcher has measured experimental results, but without some shared notion in place of what it means to measure, we can neither agree nor disagree (242). So when the discussion returns to sensations and language, the right question is not whether private sensations and public expressions are separate but why in the world we let the border cases, those moments when people lie about being in pain, govern our theories of language rather than looking at the ways in which people usually experience pain as part of everyday life (246). Lying, like other language-games, is learned, if we look at how people actually start lying (249). Even more than lying, neologisms demonstrate the complex, learned-and-inevitable character of language. If we decided to rename things, for the sake of precision, the only way to bring others along would be to define them in terms of words we already knew in common (261). Thus the notion of a “private language,” even when somebody tries to imagine one, becomes an exercise in abstracting the self from relationships prior to the assertion of the self, and the more rigorously one attempts to separate any “private language” from extant, historical language, the more one must push against–and thus return to relationship with–languages not as one invents them but as one receives them. Even more, when we press the concept of language, we realize that things like “looking up” definitions are inherently common acts; to test an unspoken and unwritten proposition against another unspoken and unwritten proposition is as meaningless as performing experiments that nobody observes; we can say we did such things, but nobody would regard them as worth calling “experiment” or “definition” (265). Demonstrating the absurdity that arises in such attempts, Wittgenstein suggests that formulating definitions without some public reference is something like “giving a gift” to oneself by moving an object from one hand to the other (268). Something happens there, but most of the time none of us would call that a gift, just as none of us would regard a definition, without public reference, really a definition. Some of what’s going on here strikes me, in 2015, as somewhat useless. After all, relatively few talk about “private languages,” except as a concept that Wittgenstein thought-experimented into oblivion, any more. But when I teach, I still do encounter students who insist that “I don’t care what anybody thinks about me” and that “I don’t need other people to approve of me” without noting that such public utterances inherently invite others to think about the one uttering and that the character who doesn’t need approval is itself a type of character that one takes on in order for others to approve of one’s not-caring. My hunch is that, even among those who don’t spend as much time as I do around nineteen-year-olds, other such analogues might make this sort of examination worth undertaking. In sections 281-286, the last ones I’m going to treat in this post, Wittgenstein turns to the human body and the ways that it shapes our metaphors and grammatical tendencies. In the translation of Philosophical Investigations that I’ve been using, Wittgenstein suggests that for pain to be intelligible, one must begin with the assumption “that only of a living human being and what resembles (behaves like) a human being can one say: it has sensations; it sees; is blind; hears; is deaf; is conscious or unconscious” (281). To attribute such things to inanimate objects, as in a fairy tale or in a session of playing-with-dolls, is a secondary phenomenon, a provisional assignment of humanity to those things (282). The pattern of thought here extends to the possibility of facial expressions (285) and localized pain (286): certain phenomena that we think of as abstract are tied to the human body, its size, and its limitations than our usual unthinking usage assumes, and part of the task of this book is, once again, to draw attention where before we’ve been inattentive. Having gone this far in Philosophical Investigations, I do begin to wonder what it would mean to be a Wittgensteinian, if this were the only book with which one were familiar. (I understand that other posthumous publications come into the picture, but this is the Wittgenstein book with which I’m most familiar.) 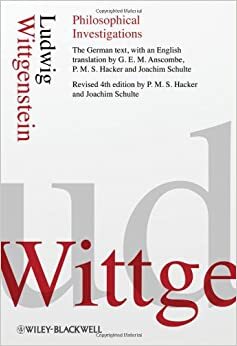 My sense, on this (my third) read-through of the book, is that I can’t really articulate any specific dogmas of Wittgenstein, at least not any that don’t get contradicted and then re-presented, as I’ve outlined above. Rather, the main benefit of this book, for me as a Christian at least, is to train and re-train my own processes of questioning, not to yield to an unexamined dogmatism about philosophical questions but also not to relinquish the reality that something like rules and definitions and sensations and such affect what I do and what I say and what I think. To maintain that tension requires work, and the sense I get is that Wittgenstein is helping me do that work. I think that’s what I’ll stick to for now.